The main goal of the BiOPs Network is to improve the health of the North Pacific Ocean by reducing the amount of plastic pollution entering the marine food webs. To this end, we are using seabirds and fish as biological samplers of litter at sea and quantifying changes in the amount and types of bioavailable plastic pollution levels in the major oceanographic regions of the North Pacific. Oikonos conducted a review of the 'state of knowledge' that demonstrated that the phenomenon of seabird plastic ingestion has been widely documented in seabirds and warrants an urgent need to implement a robust approach to quantify the severity of exposure and trends over time. Multi-species evaluations have shown that while plastic ingestion occurs in many taxa, the incidence and loads vary geographically and temporally, as top predators ingest plastic directly and secondarily from their prey. Abundant seabird species are accidentally caught in fisheries, providing samples for multiple decade comparisons. 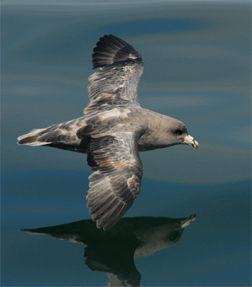 Short-tailed Shearwaters and Northern Fulmars taken by Alaska longline fisheries are an example of legacy species.. 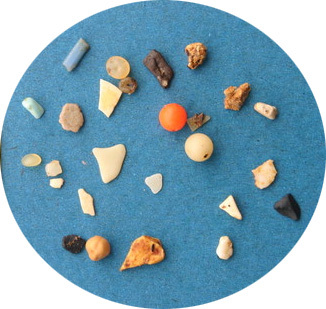 Species with restricted foraging ranges can indicate local levels of plastic pollution. 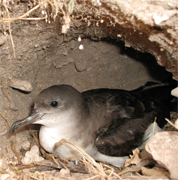 Wedge-tailed Shearwaters nesting in Hawaii are an example of an indicator of pollution in the central Pacific. Hawaii Necropsy Lab - Hawai'i Pacific University, led by David Hyrenbach with students Shannon Lyday, Dana Ahlin, John Johnson, Sarah Youngren, Dan Rapp, and Travis Wahl. Tacoma Necropsy Lab - Located at University of Puget Sound's Slater Museum of Natural History, led by Peter Hodum and Gary Shugart. These new classroom activities incorporate current data from BiOPs' collaborative research. To standardize quantification of plastic ingestion in both the North Pacific and Atlantic, Oikonos and the Marine Wildlife and Veterinary Care and Research Center hosted a week-long workshop to standardize techniques with the successful program in the North Sea managed by Jan van Franeker of IMARES. Biologists from 7 institutions participated (see collaborators). The ultimate value of this work is to detect improvements in pollution levels as a result of multi-national efforts to reduce marine debris. Long-term funding is needed to obtain the necessary time-series to detect changes over the long term. Seabirds indicate Plastic Pollution in the Marine Environment: quantifying spatial patterns and trends in Alaska. 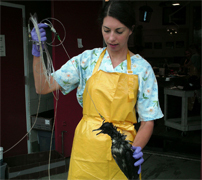 Seabirds as indicators of plastic pollution in the North Pacific.